The LXE is designed to be your console. Every knob, every button, every display can be programmed to accommodate virtually any application you come up with. No need to compromise anymore. LXE is Wheatstone's most modular console ever. Simply group the modules into bays and connect them to your network with a single CAT6 cable. This allows you to use them in tabletop frames, with or without a meterbridge, with no need to cut furniture. Or, you can flush mount them right into your table, easily splitting them as you need. Full colour OLEDs reflect your programming, and the touchscreen GUIs let you interact with your audio in fresh new ways to do everything from pinching and dragging EQ to setting up router crosspoints in your network. ScreenBuilder™ LXE is included so you can create your own touchscreens. And ConsoleBuilder™ is a GUI-based app that allows you to program and configure your hardware surface. Simply put, there’s never been a more customizable way to work. Wheatstone’s new LXE console brings control surface configuration to a new level. Going far beyond the usual “any source to any fader” network concept, the LXE is a fully flexible control interface, where every switch and rotary control is programmable to perform any desired function. This means console architecture is completely customizable to client requirements, and limitations to functionality are no longer a factor. Physically compact, the LXE is available in several different form factors including countertop, countertop sunken, and split frames (split sections are not confined to one room; they can actually be in different studios). 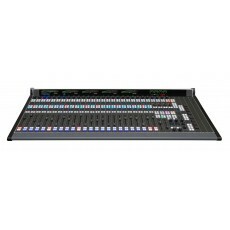 The LXE can have up to 32 physical motorized faders, with full DSP processing available on all 32 channels. Surfaces interface seamlessly into the WheatNet-IP Intelligent Network, and utilize BLADE-3s for audio, control and associated logic data flowing on single CAT6 interconnecting cables. The system can ingest and convert virtually all audio formats: mic and line level analog, AES/EBU, SPDIF, AoIP, MADI, SDI and even AES67. Loudness metering, phase control, and full EQ/Dynamics are included. ConsoleBuilder™ software allows every switch on the surface to be programmed for function, mode, and even colour (switches are RGB led illuminated). In fact, built-in software allows every button to be scriptable, letting you create powerful macros for as many controls as you want. Multiple full colour OLED displays on each panel keep pace with ongoing operations, and event recall allows painless one touch console reconfiguration at the press of a button. With its inherent control flexibility and ability to access thousands of signals (sources and destinations are limited only by the size of the network), the LXE takes facility workflows and audio control to a new level. LXE’s new GUI is has pre-built screens for everything you normally use – metering, clocks, timers, dynamics, EQ, assigns, and more. All are touch-screen accessible with gestures you’re used to using on your smart devices. And, the GUI is just as customizable as the LXE surface. Using our ScreenBuilder™LXE software, you simply drag and drop objects and define their functions via a simple wizard interface. You can store multiple custom screens, if you like, to go with your custom LXE setups. Every encoder/knob configurable from the setup GUI, Can be scripted (if X then Y) or assigned to other knob or encoder functions. Fader is scriptable to control things via ACI like Utility mixer channels. 8 layers (to accommodate up to 32 input fader channels) – completely customizable and configurable for each layer. Front end app can be used on Windows, Linux, or Mac for additional display of surface functions.